The Mayans may have created a civilization which lasted thousands of years but their greatest achievement is surely being the theme for various online slot machines such as Jaguar Temple; it’s developed by Thunderkick and it features giant symbols and plenty of free spins. Jaguar Temple is a five reel slot with three rows and twenty fixed paylines; fires on either side illuminate those reels which spin on the sides of an ornate stone wall under the gloomy night sky. The high value symbols include the jaguar as well as various stylistic representations of animals; carefully carved playing card symbols in red. green, blue and orange make up the lower values. The wild is a blue-eyed priest in a golden mask and he will substitute for all others to help form winning matches except for the pink & gold scatter symbol. Also a mention for the jaguar which can appear stacked, as a single symbol and also as a giant 3×3 icon – it will payout as long as there are at least three adjacent on a payline anywhere on the reels. This is triggered by landing three, four or five of the pink and gold scatter symbols anywhere in view for which you will receive 10, 15 or 20 free spins respectively; during this round landing two, three, four or five scatters will award another 3, 10, 15 or 20 spins. 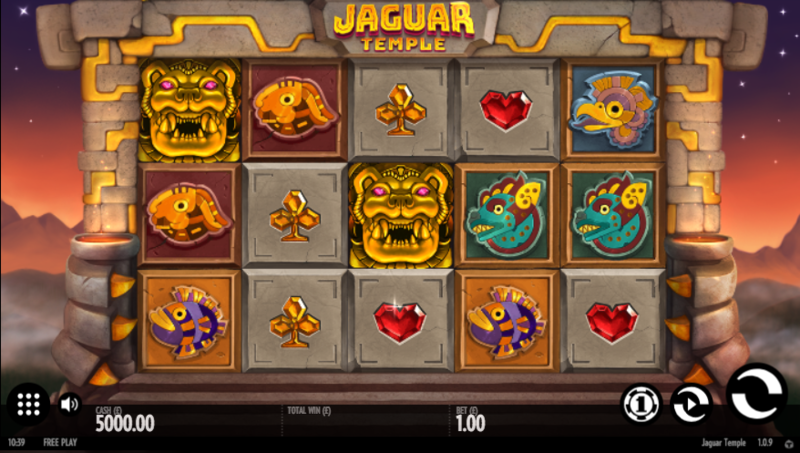 Jaguar Temple is another good-looking slot from Thunderkick with some atmospheric gameplay enhanced by some giant symbols and plenty of free spins for the luckier players. Certainly worth checking out and it comes with an RTP of 96.10%.